For other uses, see Breakaway. Breakaway is the name of three fictional characters from the Transformers series. The first Breakaway was an exclusive membership toy for the Transformers Collectors Club released in 2007. The latest Breakaway appeared in the Revenge of the Fallen video game voiced by Andrew Kishino. "Life is its own purpose. Its preservation is mine." Breakaway is an OFTCC club exclusive. He is an ancient Transformer with gaps in his memory. He had the ability to heal other Transformers using energon. He combines with the other 4 Transformers Collectors Club membership combiner exclusives to form Nexus Prime. Breakaway first appeared in issue #16 of the Transformers Collectors Club magazine and got a full page biography in that issue as well. Breakaway was placed on Earth millions of years ago by Primus to guard a super energon pool until he was called on. In "Crossing Over" Skyfall and Landquake and the Autobot Cliffjumper (assigned by Optimus Prime to watch Skyfall) arrived in the underground energon pool together and met the Autobot Breakaway, who was guarding the pool, but had little memory of why. Together the three Transformers who seemed to feel they were connected, and Cliffjumper who refused to leave Skyfall, were sent through a dimensional portal by Breakaway's Caretaker computer to find their "fourth". In "Transcendent" Breakaway, Landquake and Skyfall arrived on a parallel Transtech Cybertron, in the city of Axiom Nexus. They were greeted by that world's Cheetor and Silverbolt, and were worried that Cliffjumper has gone missing. The arrivals were told that they were among many to arrive on this world and are brought to "processing." After processing the three Autobots were greeted by the ancient Autobot Alpha Trion and taught in the ways of outworlders in Axiom Nexus. Breakaway was then abducted by Transtech Shockwave. Joining with Alpha Trion's group they raided Shockwave's lab and recovered Breakaway, then escaped to his home world through a dimensional portal. Just before leaving, Alpha Trion stabbed Skyfall through the chest with his sword. In "Reunification" the escapees returned to Alpha Trion's lab, where they were joined by several Autobots and Decepticons from his home world that were loyal to him. Alpha Trion killed the Autobot Downshift, who discovered their lair. Although Alpha Trion claimed that Skyfall was shot in the escape by the Transtechs, Breakaway noticed that the wound was caused by a blade like Alpha Trion's. Alpha Trion then ordered his forces to restrain Breakaway, Landquake and Topspin. He is a recolor of Energon Treadshot and Windrazor. He was the free figure given away with membership in the Transformers Collectors Club in 2007. This mold was later used for Universe Air Raid and Airazor. According to the biography printed in the collected Reign of Starscream books he has a reputation for letting himself be captured just to escape and sabotage his enemies. In Transformers: Defiance #1, back on ancient Cybertron Breakaway is among Optimus' crew at an excavation site near the temple at Simfur where an artifact is uncovered. In issue #2 Breakaway sides with Optimus Prime against Megatron's orders to counter-attack their invaders. In Tales of the Fallen #6 Arcee, Breakaway and Clocker are on a mission together when they are attacked by the Deceptcons Flatline and Thundercracker. The Autobots are defeated, but Arcee's spark is used in an experiment to activate Decepticon protoforms, which gives her a new three-part body. She uses these bodies to free the Autobot captives Skids and Mudflap from the Decepticons and escape to Earth. The appearance of Breakaway is modified in the IDW Publishing stories so that his head more resembles movie style's alien-bug-thingie style than the movie toy and (presumably) he has a Cybertronian alternate mode. This toy is 14 centimeters long, while a real Chrysler ME Four-Twelve is 454 centimeters long. This gives the toy a scale of 1:32. The robot mode would stand about 14 feet 11 inches tall. 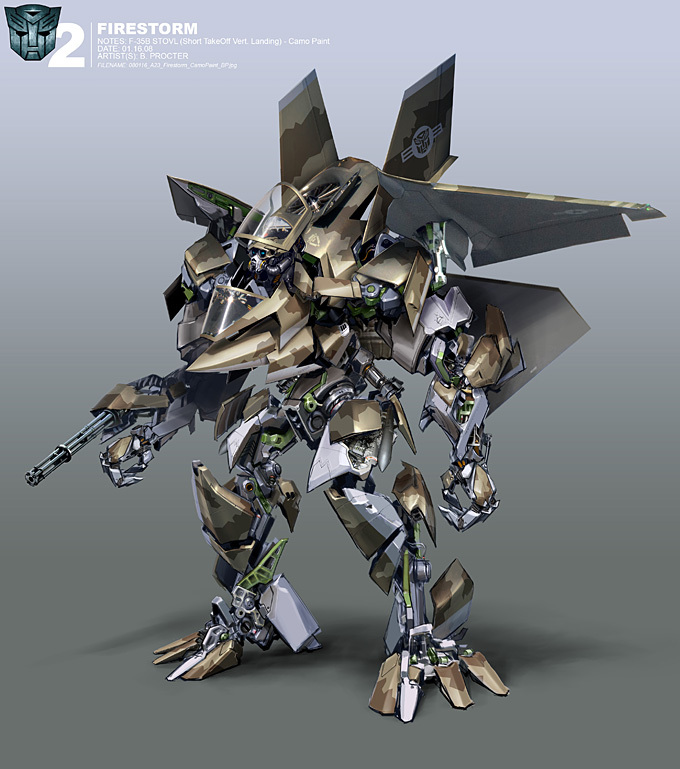 Breakaway is among the playable characters in the 2009 Transformers: Revenge of the Fallen video game by Activision. Breakaway appears in Transformers: Nefarious #1, set months after the events of the 2009 film. Bumblebee, Breakaway, Jolt, Knock Out and Dune Runner are sent to investigate spark fragments detected at Kingdom Petrochemicals. Arriving first Breakaway is warned by Soundwave to leave, but unwilling to give in the Autobot is swiftly defeated. Bumblebee and his team fire on Soundwave, who escapes. Breakaway is a 1:87 scale F-35 Lightning II fighter jet. As a robot this 16 centimeter toy would stand about 45 feet 8 inches tall. Primarily tan-colored, this figure is also available in a brown-colored variant. This toy was redecoed into the Decepticon Thrust. The name Breakaway was also used for the Titans Return version of Autobot Getaway. ↑ "Autobot Breakaway". Transformers Collectors Club magazine (Fun Publications): p. 9. August/September, 2007. ↑ Transformers Collectors' Club 2007 Free Membership Figure! ↑ Concept art showing Breakaway named as Firestorm.